Being known as one of the shorter bodybuilders in today's pro circuit, he can hold his own with any of the giants! He is known for regimented eating as he has a military background to go by. David really does eat extremely well. Tip 1 - Dramatically increase your total caloric intake on the weekends through the overload technique. Tip 2 - Consume at least one gram of protein for every single pound of lean body weight to gain size. Tip 3 - Don't be afraid to eat foods such as burgers or pizza on high caloric days. Tip 4 - If you begin to add body fat, scale back your calories and increase your cardiovascular training. Being the giant killer as many in the past before him came, David really has been able to defeat many other competitors due to his mass, thickness, condition and overall presentation. Remember, bodybuilding is a illusion on stage. 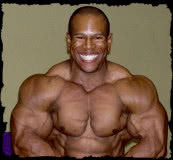 David Henry is also known for training under the DC (Dog Crap) method and has been known to move some heavy poundages.